Ducks have been raised on fish ponds in Eastern Europe and parts of China for several centuries. Ducks have been raised on fish ponds in Eastern Europe and parts of China for several centuries. Though the compatibility of ducks and fish have long been recognized, the interaction and benefits of the association have been understood only in more recent years. Considerable progress has been made in developing suitable methods of raising ducks on fish ponds in East European countries. Such integrated farming is practised widely in Taiwan and on a limited scale in a number of other tropical countries. As presently practised, the combination of duck and fish farming is seen as a means of reducing the cost of feed for ducks and a convenient and inexpensive way of fertilizing ponds for the production of fish food. Obviously, more animal protein can be produced per unit area by such a combination. The ducks search for and feed on a variety of organisms, including tadpoles, frogs, insects, insect larvae, snails and water weeds, which need to be eradicated from ponds. The protein content of supplementary feeds which are necessary to achieve high production rates for ducks can be reduced to 10 or 15 per cent when the ducks are raised on ponds. In addition, the pond provides a clean and healthy environment for the ducks. Special strains of ducks suited for pond raising have been developed. If a suitable strain is used, approximately 50–60 per cent of their droppings will fall into the pond and act as fertilizer to the fish food organisms. 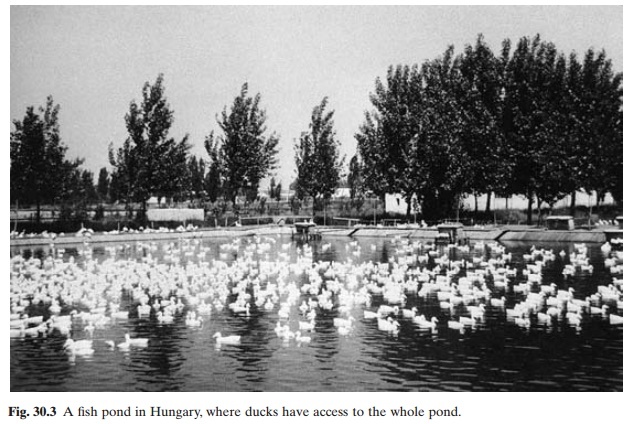 The barrage type of ponds, made by damming shallow valleys, are believed to be the most suitable ones for duck/fish farming, as the ducks can lie on the natural slopes (Woynarovich, 1980). There is a likelihood of ducks damaging earthen dikes while foraging for food, but with proper reinforcement and maintenance, this problem can be solved. Timely and reliable supplies of good-quality ducklings of the required strain are of critical importance in successful farming. While small-scale producers may have to depend on outside sources, larger farms will find it more convenient and profitable to have their own breeding centres. The breeders are selected after the first egg laying, which commences when they are about six to seven months old. A protein-rich feed, suitable drinking water and appropriate temperature are some of the essential requirements for breeding stocks. They are fed at the rate of 9–10 per cent of the body weight, i.e. about 240–300g per day. About 120–140 eggs are produced by a female every year. The incubation time for the eggs is about 28 days, and a survival rate of 75 per cent of one-day-old ducklings can be expected. These one-day-old ducklings require special care and have to be reared in a controlled environment to the age of 10–14 days. A temperature of 30–32°C ismaintained in the rearing room, which can hold 50–55 ducklings per m2. A screen floor is provided to allow manure to fall through. Duck-lings are fed on pelleted starter feed and tepid water is provided for drinking from special troughs. After the third or fourth day, the duck-lings are released to shallow splashing pools to become accustomed to water. During the second week they are allowed to swim in small indoor conditioning ponds and are fed on prepared feeds. The ducklings are ready for release into fish ponds in 14–20 days, depending on weather conditions. In East European countries, about 300–500 ducks are raised per ha of ponds during the summer season. The rapid growing strains of ducks presently used reach a marketable size when about 42–58 days old. During the period of about five weeks when the ducks are on the ponds, they contribute approximately 2.1–3.5 tons of droppings to fertilize them. The composition of duck droppings is given. There are two basic ways of keeping ducks on fish ponds. One is to allow them free access to the whole pond area and the other is to confine them to enclosures (figs 30.3 and 30.4). When the ducks are allowed to swim around freely on the pond surface, a good proportion of their droppings fall directly into the pond and are distributed more or less uniformly. The ducks are able to forage around the whole pond for food organisms. Small duck houses are built on or near the ponds with facilities for providing the ducks with prepared feeds. In such a system, considerable energy is used up by the ducks in swimming around and this is believed to affect the growth rate and feed conversion. The second option of confining them in enclosures is preferred by many farmers, who use selected strains of ducks for maximum growth. Wire fences are built, enclosing part of the pond area and adjacent banks, and suitable feeding and resting areas are provided. About one-quarter of the enclosure will be on land and the rest in water. Some of the droppings fall directly into the pond, and the rest have to be washed into it. Wave action and water circulation ensure distribution of the manure and manured water in the whole pond. It is reported that fish production under this system is nearly equivalent to the free-range system. As in pig/fish culture, the most common species of fish used in duck/fish culture are herbivores and omnivores. In East European countries the common carp was traditionally the main species, but now the Chinese carps are also included to make full use of the food resources in integrated polyculture systems. As supplementary feeding is generally carried out, fairly high stocking rates can be adopted. A fish yield per ha of 500–600kg silver carp, 150– 200kg bighead carp and 1000–1200kg common carp of marketable size is common in Hungary. The same production can be achieved without supplementary feeding, if the proportion of Chinese carps is increased. However, since the consumers prefer the common carp, it continues to be the main species. Duck production is about 1000–1200kg (each weighing 2–2.4kg). In Taiwan, ducks are raised on fish ponds in the southern part of the island for the production of eggs as well. A hybrid of the native mallard and the drake of the muscovy is raised for meat, and the native mallard is raised for eggs. About 2000–4000 ducks are raised per ha of ponds, depending on the depth and abundance of the water supply. Four crops of an average of about 3200 ducks can be obtained. The egg-laying ducks start producing eggs in four to five months when they reach a weight of 1.2–1.5kg and they continue to lay for two years, after which they are sold. Each duck lays about 250 eggs per year; 1500 egg-laying ducks are raised per ha of ponds and so the annual output of ducks’ eggs per ha is about 375000. Both the hybrids and the native strain are fed pelleted supplementary diets. As well as the three species of Chinese carps (grass carp, silver carp and bighead) and common carp, other important species used in Taiwan are the hybrid tilapia (mainly Tilapianilotica malex T. mossambica female) and thegrey mullet. Small numbers of eel, Asian catfish and sea perch are also added in polyculture, making roughly 11000 advanced fingerlings and young fish (Chen and Li, 1980). Tilapia and the mullet together make up over 70 per cent of thefish stock. Some farmers stock only male tilapia.